Intersections like Suffolk and Delancey Streets, and East Houston Street and the Bowery were among the most dangerous for two-wheeled commuters. Three intersections in the East Village, including the corner once known as “Dead Man’s Curve,” were the site of 11 crashes. Mr. Crooks points to one of the main causes: cyclists from Brooklyn traveling over the Manhattan and Williamsburg bridges. 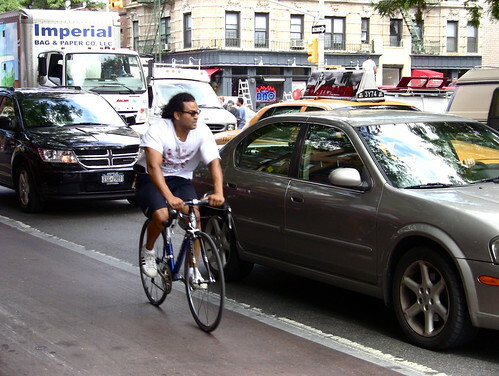 A spokeswoman for the Department of Transportation, Nicole Garcia, said that the streets are safer than ever for cyclists (since the advent of cars, anyway). “These numbers represent a fraction of the number of cyclists crossing these intersections,” said Ms. Garcia, adding that over the past decade bicycle ridership has tripled while serious cycling accidents have declined by 72 percent. Still, there have been three deadly cycling accidents in roughly the last month; one of which claimed the life of local bar owner Ray Deter. Mr. Crooks said that the lack of a uniform grid layout south of 14th Street was another reason why the Lower East Side and East Village is more accident-prone. View Accident-prone intersections in Manhattan in 2008 and 2009 in a larger mapStephen Rex Brown Data courtesy of NYC DOT.